The Davidoff Primeros are another premium cigar line from the legendary Davidoff brand, known as one of the highest rated luxury cigar makers in the industry. Davidoff Primeros are miniature-sized petit panatela cigars made in the Dominican Republic. Each of these hand-rolled premium cigars are infused with various premium tobaccos from different regions of the world, Ecuador, Nicaragua and Dominican Republic. 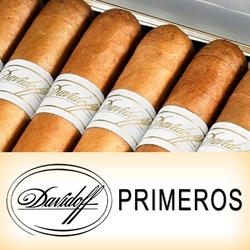 Davidoff Primeros are offered in a variety of styles from mellow to full-bodied. On the mild side, Dominican Natural’s are crafted with an aged US Connecticut Shade, while the Dominican Nicaragua’s are rolled in a Nicaraguan Habano wrapper. Dark tobacco leaves cover the elegant tobaccos inside both the Dominican and Nicaragua Maduro’s. And standing alone is the Escurio, with its Brazilian and Dominican binders and fillers wrapped up to perfection inside an Ecuadorian Habano Seed. Offered in a variety of packages of 6 premium handmade cigars in each tin, each style of Davidoff Primeros provide a sweet and smooth smoking experience for any cigar connoisseur who enjoys the relaxation of a high-quality premium cigar or just needs a quick smoke on the run. Smokers Discounts can bring Davidoff Primeros right to your doorstep. We’ve made it affordable and easy to buy premium cigars online. A variety of sizes and flavors are listed below in our online cigar store. Each of these styles are in stock and available for a low discount price! Call us for more details!